-To get the children for transportation (school & villages). -To provide education, 2 nutritious meals per day, protection, adequate healthcare and education for orphaned children or those living in extreme poverty. -To break the cycle of poverty by enabling individuals & communities to become self- sufficient through education and practical skills training. -To carry out our work without discrimination and offer equal opportunities regardless of race, age, gender, sexual orientation, disability or beliefs. -To encourage our children to embrace the knowledge of local Khmer customs, including dance and music, so that this knowledge is retained for future generations. 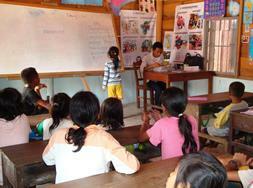 The activity volunteers teaching Khmer at ATE school !